Bristol Academy captain Corinne Yorston has left the club to join Women's Super League Two side Yeovil Town. The Glovers Ladies' have described the 31-year-old England defender as the "biggest signing" in club history. 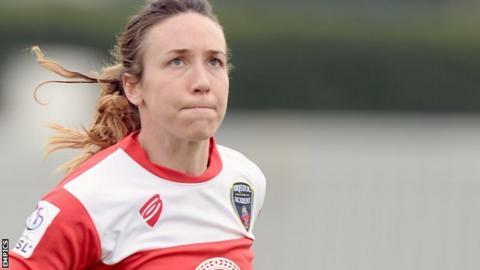 Yorston leaves Bristol as the club's longest-serving payer, having spent eight years with the Vixens. "I am disappointed to be losing Corinne. She is a big character and will be missed," Bristol boss Dave Edmondson told the club website. "At this stage of her career, a new challenge is what she feels she needs and we support her in her decision." Yeovil manager Jamie Sherwood said Yorston's arrival will be a major boost for the side as they look to improve on their fifth-placed finish in England's second-tier competition last season. "We truly believe that everyone within the club can benefit from this signing," said Sherwood. "She is a role model to our younger players within our youth, intermediate and development teams." Yorston is the latest player to leave Bristol after midfielder Alex Windell recently joined Birmingham City. Laura Del Rio, Natalia Pablos Sanchon, Jemma Rose and Natasha Harding have also departed.